Former president George H.W. Bush is expected to be taken out of the intensive care unit soon, while his wife Barbara Bush was discharged from a Houston, Texas, hospital on Monday. The 92-year-old former president was struggling to breathe when he was admitted to the Houston Methodist Hospital Jan. 14, and had since been treated for pneumonia in the intensive care unit. Ninety-one-year-old Barbara Bush was suffering from bronchitis and entered the same hospital Wednesday. Two doctors who have been treating the Bushes, Dr. Amy Mynderse and Dr. Clint Doerr, talked about the Bushes medical treatment during a news conference at the hospital. Mynderse said the former president had been sitting up and watching television, describing him as "not your average 92-year-old." He's expected to be out of intensive care at some point Monday. 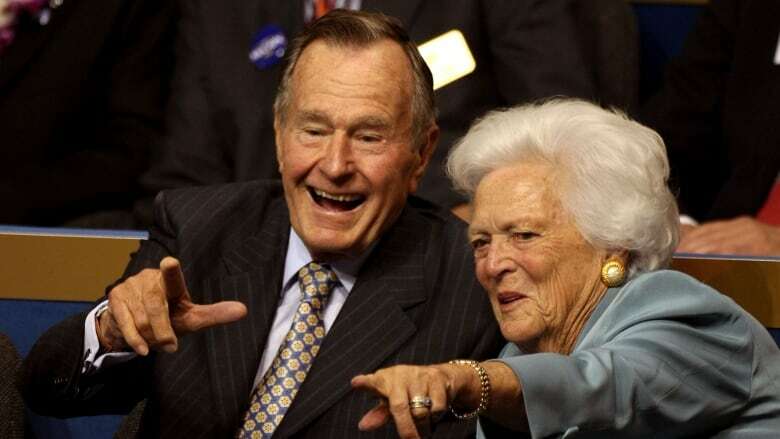 She said Mrs. Bush has been discharged and "she is back to her normal self." At one point during the former president's stay, doctors inserted a breathing tube and a ventilator was employed to assist his breathing. The tube was removed Friday. Mynderse told reporters that when she informed the 92-year-old former president she would be speaking at a news conference Monday, he replied: "About what?" Mynderse says Bush appeared incredulous that people would want to know about him. She says: "They're so humble. They truly are the most humble people." Family spokeseperson Jim McGrath said Barbara Bush was given the option of leaving the hospital Sunday, but she opted to stay overnight to continue her recovery and be close to her husband. The Bushes thanked "their well-wishers for their kindness, and especially their prayers," McGrath said. The couple's 72-year marriage is the longest of any presidential couple in American history.